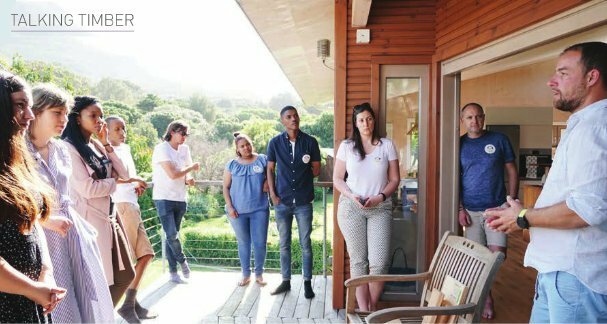 The Wood Student Foundation in cooperation with HWZ International SA and the Hout Bay House Team has come up with a unique project for architects and would-be architects. The Timber Competition is a brand new project for architects and architectural students and was recently launched to give participants the opportunity to gain experience and the chance to win a one-week internship in Europe. The Timber Competition asks participants to do a straightforward assignment: to design a sustainable timber construction for a South African Family. Interested parties can join them on their journey and follow their stories on Instagram and Facebook. What is the Timber Competition? The project focuses mainly on South African architects (under the age of 35 years) and students who must be South Africans or South African residents. The objective is to widen the interest in modern sustainable construction and encourage young architects and also to obtain new experience. The contestants will present their draft to a professional jury at the next Wood Conference in Cape Town. There are no budget constraints. The architect / student must ensure that they construct an ecologically friendly timber construction for a young family with three children - with all the necessities they might need. Participants are asked to design a house for virtual couple John and Amy and their three children. The Timber Competition has already begun and 15 participants have submitted their projects. There was also a first workshop for the contestants in October 2018, which was a wonderful experience for the young architects, jury and the organisers of the competition. Although there can be just one winner all the participants are already winners and they are part of something to be proud of, something big and amazing where they can make change happen and design a modern yet affordable home that is sustainable and eco-friendly for young families. The first prize is a one-week internship in Europe including flight tickets and accommodation. The second prize is a weekend in the Hout Bay House for a maximum of four people. All the contestants will gain experience and also the chance to network with colleagues from all over South Africa and other countries like Austria, Cech Republic and Switzerland where they will have access to innovative building material producers and suppliers as well as work with sustainable materials. They will literally (and symbolically) open the door to a new age of housing. For more information about individual drafts, visit: www.timber-competition.co.za.